Why is the number of natural gas wells within the DFW Metroplex increasing? You may have noticed recently that there are natural gas wells cropping up all over the area. Most of these gas wells are operated by various private companies in the natural gas industry that have either leased private minerals or own the mineral rights to property. The current increase in natural gas drilling within the city limits is primarily due to the fact that cities in Denton, Tarrant, Johnson, Parker, and Wise counties sit atop a large natural gas reserve known as the Barnett Shale. Though gas deposits were discovered in the Barnett Shale decades earlier, natural gas producers didn't have the tools needed to tap into the highly valued natural resource. That's because the Barnett Shale formation is shallow and dense, and the gas is scattered rather than pooled into a few large reservoirs. That's where technology comes into play. With a relatively new technique known as horizontal drilling, we can make 90-degree turns in only a few hundred feet, allowing us to tap into several pockets from a single well pad to recover six or seven times as much gas as a traditional vertical well. Horizontal drilling also has less impact on the environment. With horizontal drilling, it's possible to extract gas from property adjacent to the well. That means that natural gas can be removed from under property without being on the surface of the land. The Barnett Shale contains an estimated 26 -30 trillion cubic feet of gas within a 15-county area. Geologists tell us that about 330 million years ago during the Mississippian Period, almost 100 million years before the age of the dinosaurs, a large shallow sea included what is now the Fort Worth Basin where radiolarian and other one-celled animals lived and died and were mixed with sediment and plant material. Over millions of years the organic material was buried, heated, and converted to the hydrocarbons we call crude oil and natural gas. This layer of organically rich sediment is now called the Barnett Shale, which ranges from 250' to 400' feet thick and lies about 1.5 miles below the surface. Does the city profit from private companies operating gas wells on private property not owned by the city? No. The city only profits from natural gas drilling on city-owned property. Most drilling occurring within the city limits is being done by private companies who lease mineral rights from a mineral owner. Only the mineral owner and the mineral lessee profit from the operation. The city only receives ad valorem taxes, which the County Appraisal District collects and assesses. Who supervises gas drilling in the city? The city has gas inspectors that ensure that the gas wells comply with the city's gas ordinance. The inspectors visit all gas well sites within the city limits on a regular basis to ensure they are safe and operating properly. Does drilling for natural gas harm the environment? Any kind of drilling impacts the environment to some degree, but drilling for natural gas is more environmentally friendly than drilling for oil. And, drilling and extracting natural gas is cleaner. With the advent of directional and horizontal drilling technology, natural gas wells have a much smaller impact on land than oil wells. And, new drilling techniques are more energy efficient and cleaner. Is drilling for natural gas in the city safe? Yes. The city regulates gas well drilling within the city limits to protect the health, safety and general welfare of the public and to protect the environment. Gas well drilling within the city is regulated under City Ordinance. How far must a well bore be from my property or public structures/areas? No well may be drilled closer than 300 feet from any residences, religious institutions, public buildings, hospitals, schools or public parks. Where are the current gas wells in the DFW Metroplex located? If I live near a potential site, how will my neighborhood be affected? City regulations are intended to minimize negative impacts to the quality of life in neighborhoods. The initial gas well development work has the greatest impact on an area. Gas well setup and initial drilling will produce about the same level of noise you'd hear near a typical construction site. Once a gas well is set up and begins extracting gas, its quiet and has a minimal impact on the visual environment. City regulations require that fencing and proper signage are erected for safety. How long will the wells be in place? That depends on the amount of natural gas found in the adjacent area. A very good well can continue extracting natural gas for 10 to 20+ years or longer. Will the ground sink if gas is removed? No. 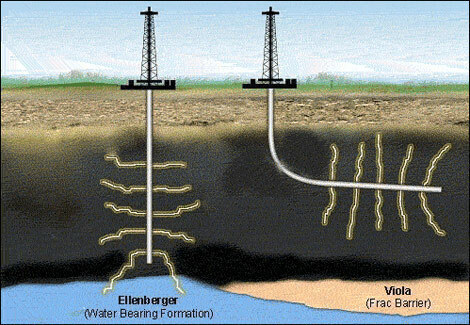 The process occurs so far underground that the ground will not sink as a result of drilling and natural gas extraction. Will the city allow drilling for oil as well as natural gas?